If you’ve lost a tooth, don’t put off replacement. The longer you wait, there is increased risk that your remaining healthy teeth may be damaged or that your smile will begin to move out of alignment. Your Boca Raton prosthodontist, Steven H. Feit, DMD, offers beautiful looking and flawlessly functioning tooth replacement options, including traditional fixed bridges and single tooth implants. When you’re ready to get started with your smile restoration, call to schedule a tooth replacement consultation with our Boca Raton dentistry team. To replace one tooth, we will recommend either a fixed bridge restoration or an implant supported dental crown treatment plan. No treatment is right for every patient, so we’ll want to review your treatment options before getting started with your tooth replacement plan. Traditional fixed bridges are made up of three main parts. A replacement tooth called a pontic and the dental crowns that are attached to both sides of the pontic. Once the parts of the fixed bridge are fused together, we attach the entire prosthetic to surrounding teeth, anchoring the replacement tooth in place, creating a flawless smile. 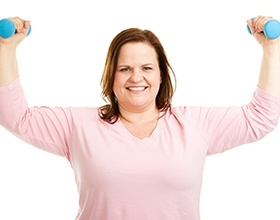 For most patients, the entire process is completed in just two dental appointments. An implant supported dental crown does require more of a time commitment, but the end result is a flawlessly functioning smile that is fully repaired from the roots up. The dental implant post is inserted into the gum line where it fuses with the underlying bone and soft tissues. 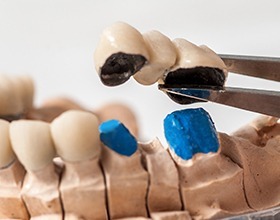 Then, a custom dental crown is designed. Once the implant is fully fused with the supportive structures, we attach the dental crown, leaving you with a flawless smile. 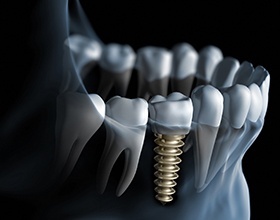 Because the dental implant posts replace the lost roots of teeth, your restoration is completely self-supporting, so your remaining tooth structures are preserved. The implant posts also provide the necessary stimulus to maintain gum and bone tissue for optimal oral health. Implant-retained dental crowns can last for three decades or longer compared with fixed bridges, which need to be replaced every five to ten years on average. You can brush and floss your implant supported crown just like you would your healthy, natural smile, so there’s no need to worry about changing your oral hygiene routine. As a prosthodontist, Dr. Feit has completed advanced training in restoration dentistry, specifically in designing and placing customized dental crowns, fixed bridges, partials, and full dentures. While a general dentist can also provide these restorations, prosthodontists complete years of additional training that ensures they have the skill to understand the best treatment methods and materials and deliver flawless results.